Have You Asked God What You Want? Ok, so I know i haven’t really written lately, but I just had to this morning. I will do another catch up post later, but just had to share about my devotional I read this morning. I read a devotional on YouVersion and it was talking about asking God what you want. It talked about the two blind men in Matthew 20 who asked Jesus to have mercy on them. They had to yell it loud over the crowd to be heard. Jesus stopped and asked them what they wanted. Get that? Jesus asked them what they wanted! The author of the devotional brought up that the blind men had to ask what they wanted even though Jesus, of course, knew. He went on to write that we too need to ask God what we want. I know I have always been taught to pray and ask God the desires of your heart, but do I really allow God to give me what I want? Have I actually asked God for I want or am I pre-judging what I ask before I make a request? I know that ultimately God will give me what He has set in motion for my life, but I still need to ask. As many YouVersion studies, there were a few passages linked to the study and this one also had a passage in 2 Kings linked to read. The author of the devotional didn’t talk about this passage, but this is what struck me. 2 Kings talks about a woman who’s husband had passed and he had owed a debt. The debt collectors were going to collect her two sons to pay the debt, so she cried out to the prophet Elisha for help. He too asked her what she wanted him to do. She wanted to save her sons but did not have anything to pay the debt. This cool passage tells us that the prophet Elisha tells her to collect empty jars from all of her neighbors, and to collect all of them, not just a few. He then told her to take her small jar of oil and begin pouring it into the empty jars. What happened? The jars were filled, all of them. She asked her son for another jar and he told her they were all filled. All of them! 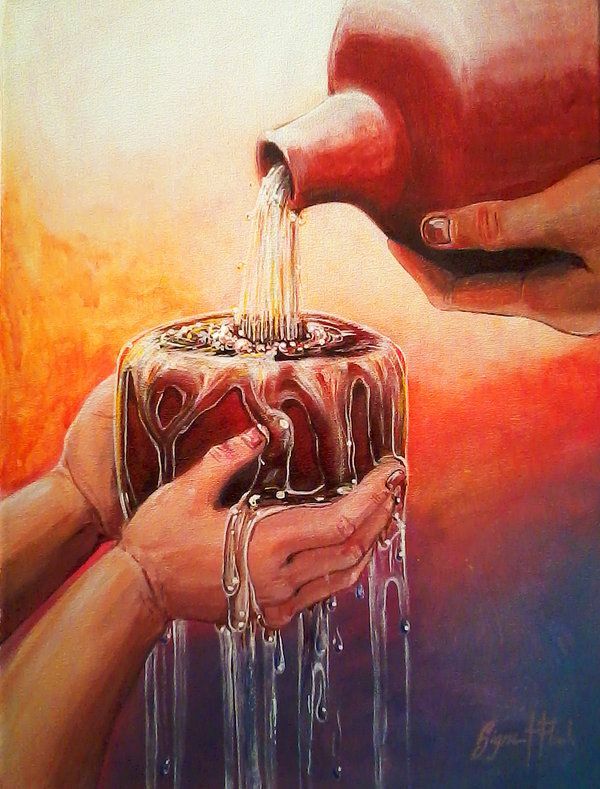 Then they sold the jars of oil and were able to settle the debt and live on the rest. This story just got me in the feels. All of the jars were filled. She asked for help specifically for a way to pay her husbands debt so she did not lose her sons. How often do I shield what I ask for? Even though I know God provides for us every single day. He fills my jars and I have an overflow of blessings. Now, I know I an not rolling in money and I certainly don’t have debts to pay that would cost me my children, but it made me tear up. I am so thankful that my God listens to my needs. He knows my needs, He knows what I need and will answer my prayers. He loves me enough to ask me what I want, asks me what is on my heart. I just need to talk to Him. I need to reach out to Him, lean on Him and let Him to do the rest. For some reason when I read the jars were all full and once they had all they needed the flow of oil stopped. I wonder how many times I get in the way of allowing God overflow His blessings on to me because I either try to do things on my own or I never asked. I have goals and aspirations I would like to reach, but do I ask God for them? Are there things in my life I should be asking God for or am I making judgements on what God wants for me before I even ask? What overflow of oil is waiting for me to ask God for? I challenge you to find an empty jar to remind you that God will fill our jar with what is needed, we just need to ask. “His divine power has given us everything we need for life and godliness through the knowledge of Him who called us, by His own glory and goodness.” 2 Peter 1:3. What do you need to ask Him today? I challenge you to do it and then see your empty jar be filled.